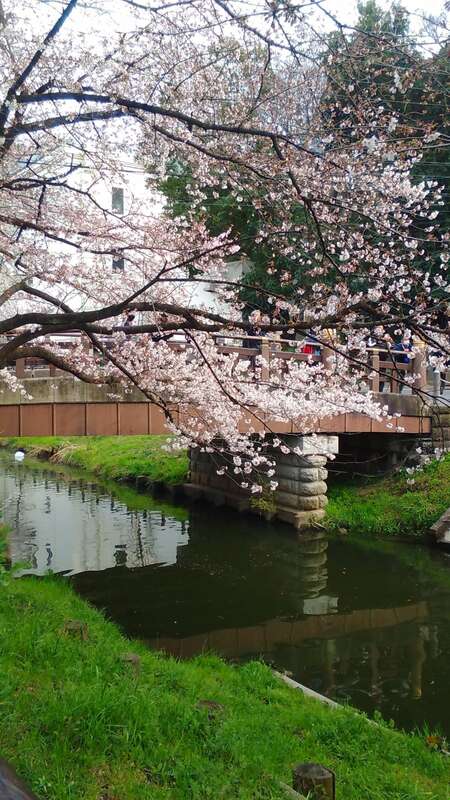 The tentative date for the Cherry Blossom Boat Ride down the Shingashi River at the back of Kawagoe Hikawa Shrine has been set for Sunday March 31st 2019. Anyone who follows this event annually knows that the date often changes due to the condition of the sakura (cherry blossom) and / or the weather. And in 2017, the event was even cancelled last minute due to snow. Please check in again nearer the date for any changes. Until recent years it was mainly locals and off-the-beaten-track tourists who enjoyed this magnificent event, but nowadays the boat ride down Shingashi river in Kawagoe attracts hundreds, if not thousands from near and far. Due to this reason, you need to queue to get one of the golden tickets that will secure you passage on a short, but FREE boat ride under the blossoms. 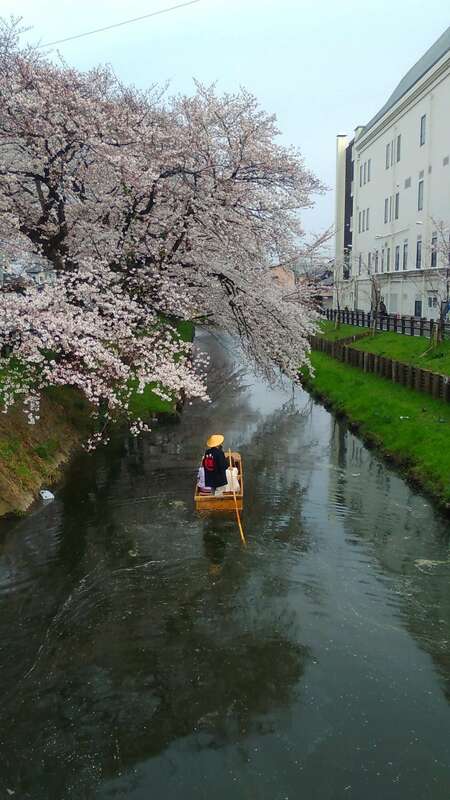 Before and after the event, you can still enjoy the sight of a man in a festival happi coat and a traditional sugegasa hat driving the boat down the river, but it is only once a year that the Cherry Blossom Boat Ride is open to the general public and free. You can also enjoy the cherry blossoms lit up at night (until 10 pm) while the cherry blossoms are in full bloom. As the cherry blossom petals start to fall, the Shingashi river becomes even more beautiful as it turns pink. 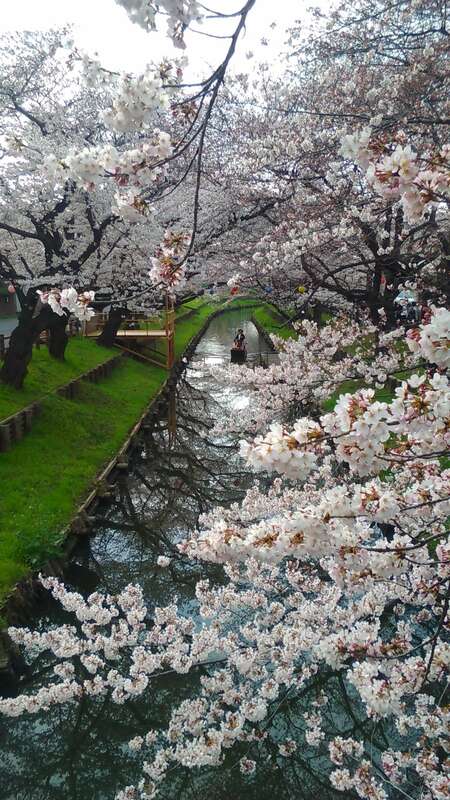 More about the cherry blossoms at the back of Hikawa Shrine on this blog. The same as previous year: the tickets will be distributed, subject to availability, in front of the Kita Kominkan on the far side of the bridge to the Hikawa shrine back entrance. (MyMap below with area marked in pink). The tickets will be distributed to the first 700 customers in line from 9 am on the morning of the ride. A maximum of 2 tickets will be given to a person in line. Children too small for a life vest are not allowed ride (generally speaking under 6 years old). It is forbidden to queue from the previous night. The place of distribution, Kita Kominkan, is marked on a Google My Map below. Some photos of Shingashi River in 2016. Koedo Kawagoe bus one day pass allows you unlimited travel on the Koedo Kawagoe buses. It costs 300 yen. In the bus they have a monitor with sightseeing information. Some tourist places give discounts on souvenirs or entrance tickets to people with a one day pass. Thanks for all of the great information! Do you know if there are set hours to see just the man on the boat (not including April 1st)? i’m a bit confused. does the boat ride run on only one day or does it also run for other days? if it runs for multiple days, is the date given (e.g. 31st march this year) the first day the boat rides start? or will there also be boat rides before and after 31st march? thank you!